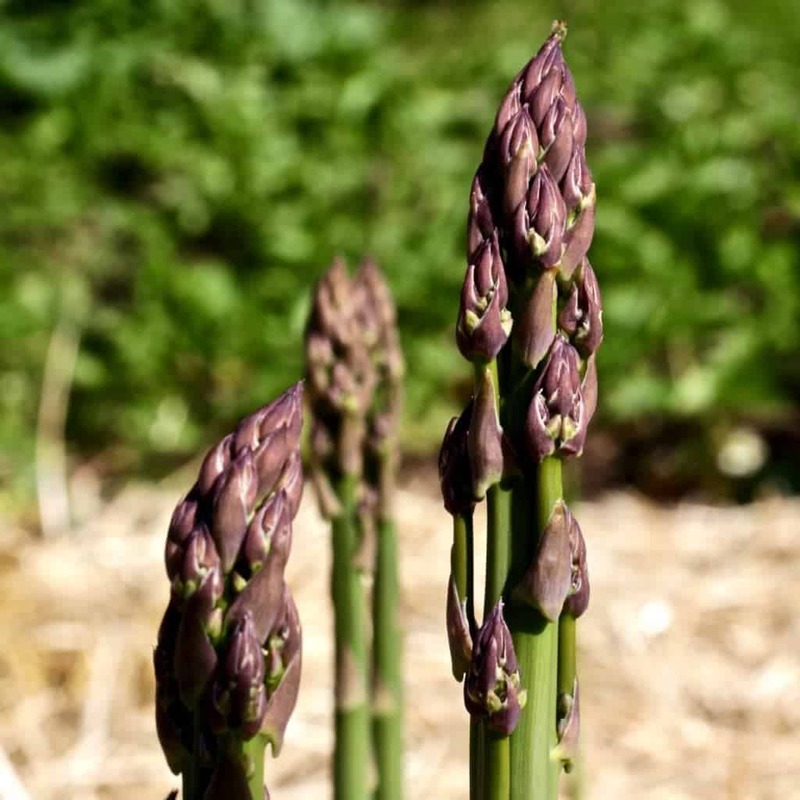 Plant asparagus for a perennial crop of spring green delicacies. Plant your bed of asparagus properly just once and you’ll harvest that crop for many many years with only slight maintenance over time. We show you how to properly choose your asparagus crowns and plant and maintain your permanent asparagus bed. An asparagus bed requires a certain amount of commitment from you, the gardener, and long range planning. The payback in nutrient and flavor gain from Asparagus grown in your garden is the best return of any vegetable you can grow! Asparagus crowns are planted in a trench. The roots are arranged over a dirt mound for each crown. Dave occasionally brings an asparagus spear or two into the house from our garden as our established asparagus (from a three year bed) throws up a shoot once in a while. He’ll track me down, wherever I am and hand delivers a just picked spear of the very best garden grown asparagus. 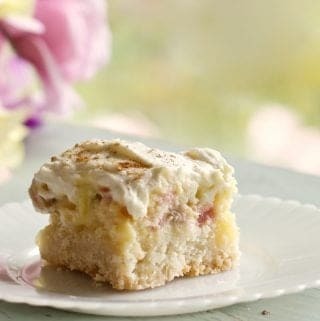 It’s a wonderfully fresh flavor with a delicate crunch. This vegetable is a Spring delicacy, freshly picked and steamed or roasted for dinner. Store bought asparagus is set in water upright to keep it fresh because it has a high respiration rate. Due to it’s very fast respire rate, Asparagus is one of the vegetables most adversely affected by long term storage. It quickly degrades. 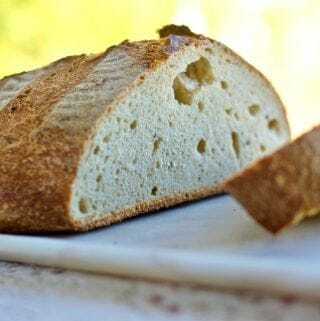 This is one crop that really is best fresh for best flavor and nutrients. So grow your own. Asparagus will last in your garden for many years so you get a lot of bang for your buck on this crop once it’s established. Asparagus is chock full of great nutrients! 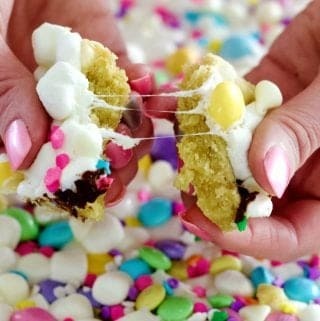 This article from whole foods makes the following points. Recent research has underscored the value of careful storage and speedy consumption of fresh asparagus. Asparagus’ very high respiration rate makes it more perishable than its fellow vegetables, and also much more likely to lose water, wrinkle, and harden. By wrapping the ends of the asparagus in a damp paper or cloth towel, you can help offset asparagus’ very high respiration rate during refrigerator storage. Along with this helpful step, you will want to consume asparagus within approximately 48 hours of harvest. 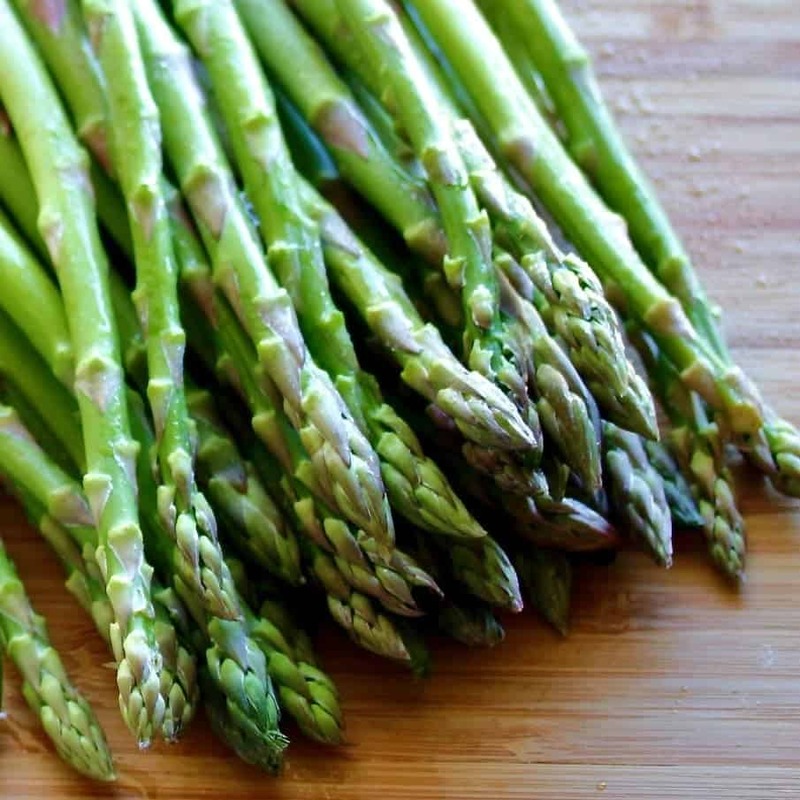 Nutritional Profile: A profile on asparagus Anti-Cancer Benefits, heart and blood sugar benefits, digestive support and much more about asparagus is available in the whfoods article. Three years ago Dave planted an asparagus bed as a newby and made some mistakes. That bed is disappointing and still doesn’t produce much for us. He found out he used the wrong variety and method. So last Spring he planted a brand new bed devoted solely to Asparagus. It’s already looking MUCH more productive than our original asparagus bed. We have learned some things about planting and growing this vegetable so we are sharing our experiences. Learn from our mistakes and grow excellent asparagus! Vigorous first year asparagus shoots in our new asparagus bed. A well planted first year asparagus bed. Healthy crowns shooting up spears. Your permanent Asparagus bed will occupy the same spot for 20 years or more. So think carefully about where it will go. Asparagus can tolerate some shade, but full sun produces the most vigorous plants and helps minimize disease. Asparagus needs a DEDICATED bed. Your yield will be adversely affected if you plant other crops in the bed with it. For example, Dave planted leafy greens over his first asparagus bed. He thought it was more efficient to put a cover crop over his crowns. No it wasn’t and asparagus doesn’t like weeds either. We use and recommend a dedicated raised garden bed for asparagus. Raised beds are easily amended and weeded. 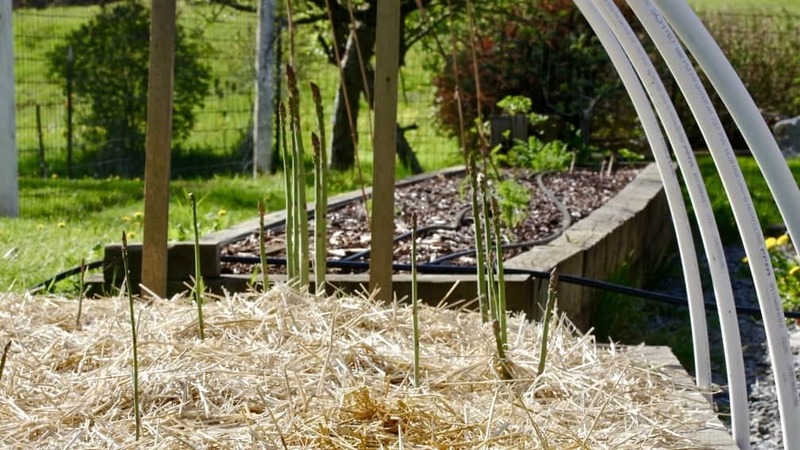 A raised asparagus bed won’t get accidentally squished by a wheelbarrow or in the way of other lower garden crops as the years go by. 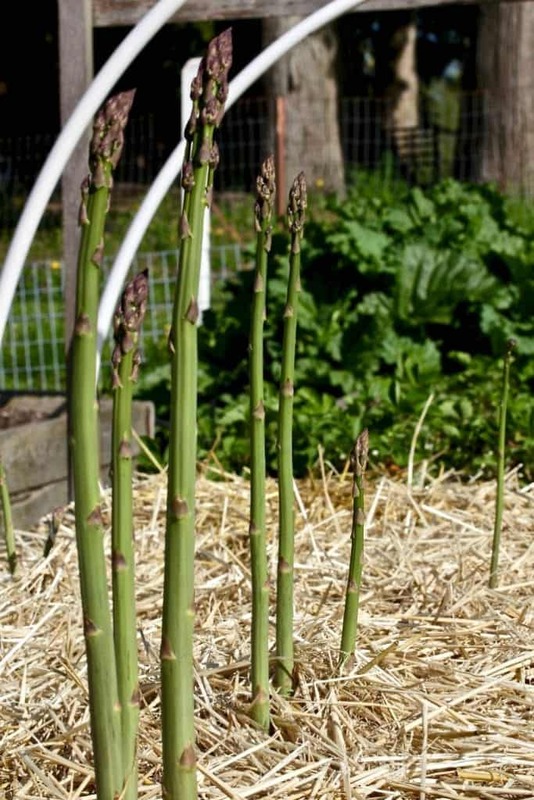 Put your asparagus in a good all round place that allows you to rotate other crops easily. It’s logistically easier all round to work and harvest asparagus in a dedicated raised bed. The soil will warm quicker too for an earlier harvest time. (Our asparagus comes up in April but we could push that timeline up by hooping the beds with plastic). A dedicated raised garden bed makes Asparagus much easier to manage. Asparagus does best in fertile, lighter soils that warm up quickly in spring and drain well. 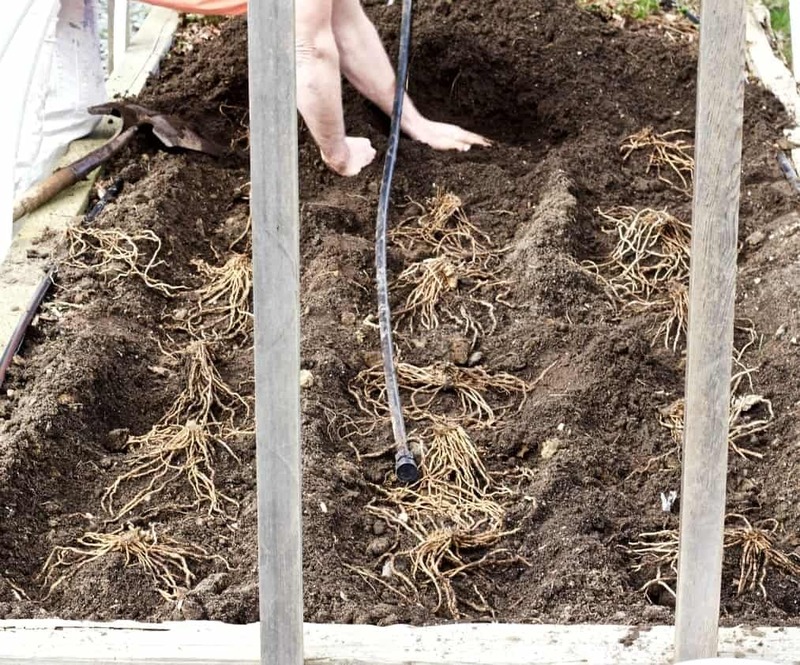 Standing water will quickly rot the roots. 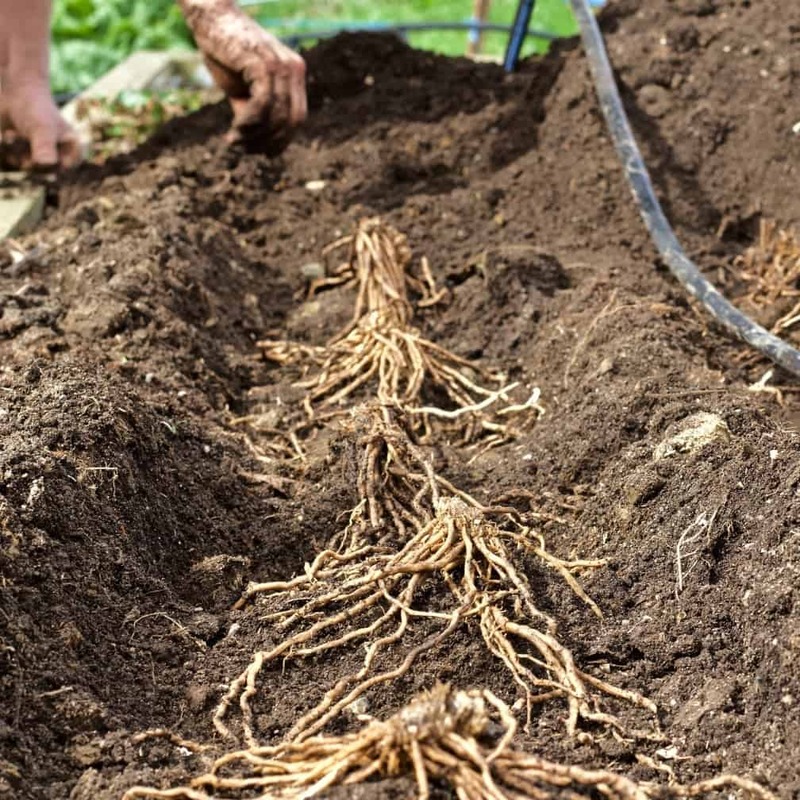 Prepare a planting bed about 4 feet wide by removing all perennial weeds and roots and digging in plenty of aged manure or compost. Asparagus is a heavy feeder so amend it before (or while)planting the crowns. Those roots need years of fertile, nurturing soil to grow and get established. Dave buys organic garden soil from our local Garden Spot Nursery and mixes it into the bed around the crowns when planting. Any good [easyazon_link identifier=”B00DT2Z20E” locale=”US” tag=”homefoodjunk-20″]organic garden soil [/easyazon_link] will work or good aged compost if your soil structure is already light with good water and nutrient retention. Choose an all-male variety if high yield is your primary goal. Our local nursery recommends the Jersey Knight variety. It grows well here and is prolific in our garden zone 8a. Dave’s first asparagus bed was planted in Martha Washington variety. They did not produce well for us. HOW MANY crowns do you need? About 10 to 12 plants per person for fresh eating. More as you prefer. Starting asparagus from 1-year-old crowns gives you a year’s head start over seed-grown plants. Two-year-old crowns are usually not a bargain. They tend to suffer more from transplant shock and won’t produce any faster than 1-year-old crowns. Buy crowns from a reputable nursery that sells fresh, firm, disease-free roots suited to your climate zone. Plant them immediately if possible; otherwise, wrap them in slightly damp sphagnum moss until you are ready to plant. Dave chose to use 1/2 of his long raised bed for his permanent asparagus bed. The area is about 12 x 4 feet. Strawberries are on the other end of the bed. We may need to move them. Strawberries are very pushy garden companions. We made a quick video to show you how Dave Planted his asparagus crowns. How To plant asparagus crowns: The Process-Year one. Soak the bare root asparagus crowns for about 20 minutes(or according to the package directions) in [easyazon_link identifier=”B00F5EQSYI” locale=”US” tag=”homefoodjunk-20″]vitamin B solution[/easyazon_link] to help them easily transition to the new bed. You can also use a compost tea for soaking the crowns if you prefer. Dig trenches 12 inches wide and 12 inch deep. The bed depth can vary due to your variety and local conditions so be sure to check with your local nurser. Dave put three trenches in side by side about 12 feet long. NOW BUILD A MOUND of dirt for each crown and arrange the crown roots evenly around the mound. So the crowns are topping at about 4 inches under your bed topline. Place the crowns in the trenches 1½ to 2 feet apart. The crown mounds should be far enough apart the roots of one crown do not touch any other. They need room to grow over the years and build a base for yummy crops. Plant asparagus crowns 11/2 feet apart. Daves are too close. 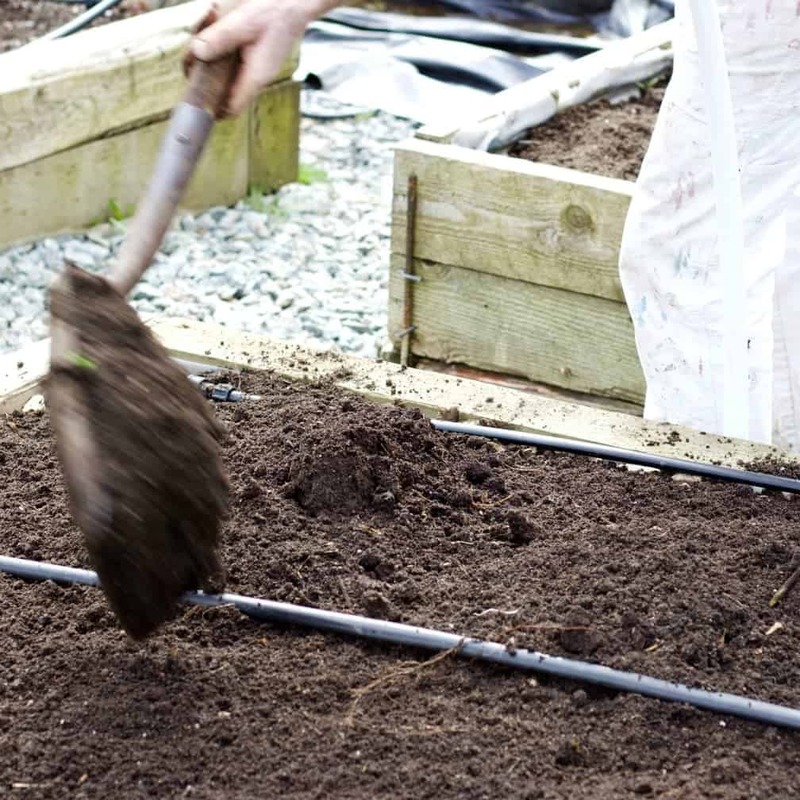 Continue adding soil periodically until the soil is completely settled and slightly mound above surface level. The bed will settle even more over the year and those crowns need to remain covered with soil. Keep adding dirt a couple of inches at a time over the next few weeks to set the crowns properly. Once the dirt is properly mounded on the bed Apply mulch(Dave used straw) to smother weeds and retain water and nutrients to the crowns. Carefully remove any weeds that do appear as they compete with the crowns for water and nutrients. Fertilize in spring and fall by top-dressing with a good all purpose 10-10-10 fertilizer, compost tea, a balanced organic fertilizer like [easyazon_link identifier=”B000VZRV4C” locale=”US” tag=”homefoodjunk-20″]Doctor Earth[/easyazon_link]. MULCH your bed through the winter to provide protection from the cold and keep it moist. Spear emerging from two crowns. Notice the spear form distinct groupings. Over time the spear will merge together as the roots grow. These crowns were properly spaced to allow future growth of the crowns. How Long before harvest? THIS is the hard part. When you plant asparagus expect to wait three years for a truly good harvest you can actually enjoy. YEAR ONE: A few spears the first year are ok for a taste but leave most of them alone. The roots need time to grow and support the plant spears. Over harvesting spears the first several years will weaken the crowns and make a less productive bed. keep the bed fertilized, mulched and watered. YEAR TWO: You can take about half the crop. keep the bed fertilized, mulched and watered. Let those roots develop! YEAR THREE: you should have a vigorous crop of asparagus that you can harvest as you wish. Continue to care for your bed and the plants will multiply themselves and reward your hard work. 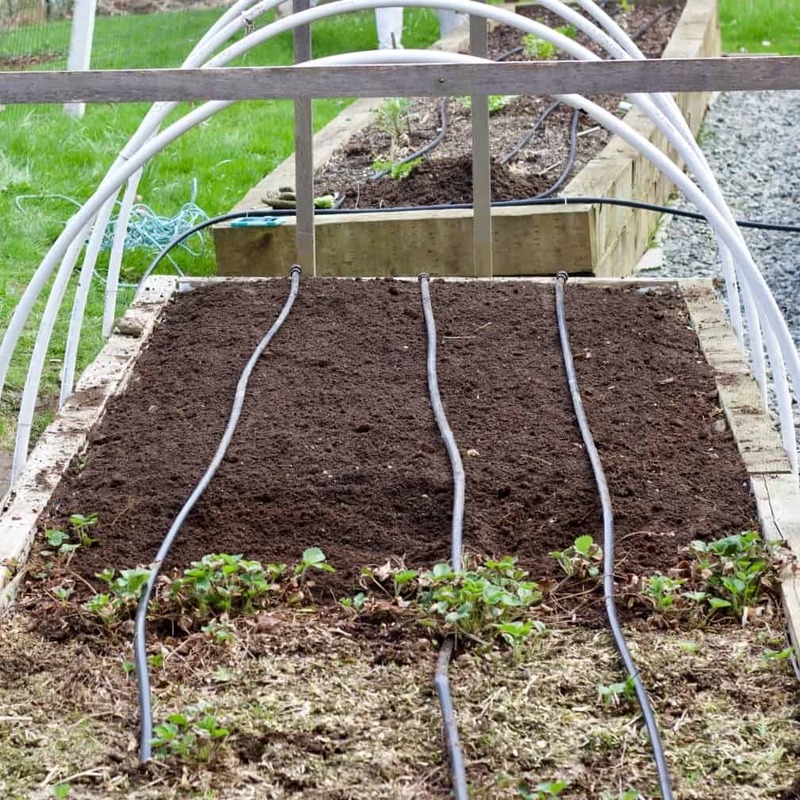 Use a sharp knife and cut the spears off just below the soil line. Fern like fronds will grow out of your asparagus in year one and two since you are leaving the stalks unharvested. You can allow these fronds to mature and go through winter. BUT! Remove and destroy the fern like foliage before new growth appears in spring. It can harbor diseases and pest eggs. Carefully dig in holdover mulch and compost (avoid disturbing the crowns). Apply fresh deep mulch, like straw to hold the weeds down and help retain moisture. Continue to mulch the bed and fertilize with good compost to refresh the crowns every year and to keep weeds down. We hope this post has been helpful to you. Please ask us questions and share your experiences with us. Have you grown this crop? How do you plant asparagus? Where are you and how is it going? Our readers love to read the comment tips. 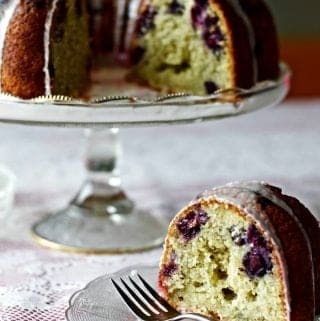 We appreciate you sharing this post with your friends! Thank you for clear and direct directs, the video was also wonderful! I was trying to plant my asparagus like strawberries, I have time to give them a probe burial, so I will cover the crowns as welk. 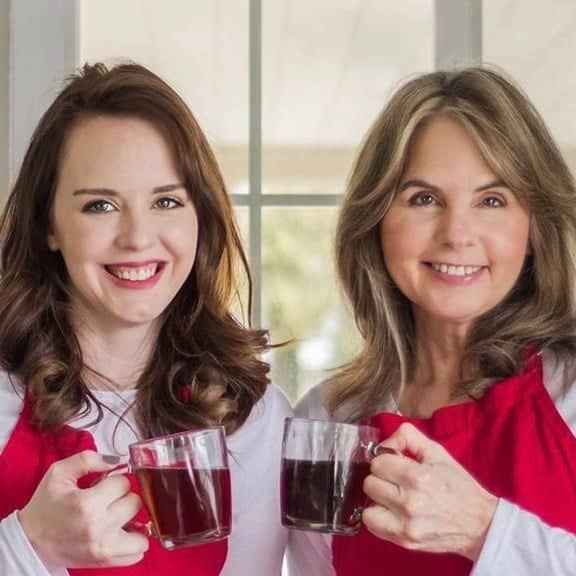 Hi s.Cooper, We are thrilled you found the post and video helpful. Yes, Bury the crown water and mulch them. Hopefully they will get a good start underground and give you a productive bed in the future. Happy Gardening! I cannot face and manage making a new bed – there are other areas that I have to catch up on: pruning and weeding. any comments, experiences I could take on board? 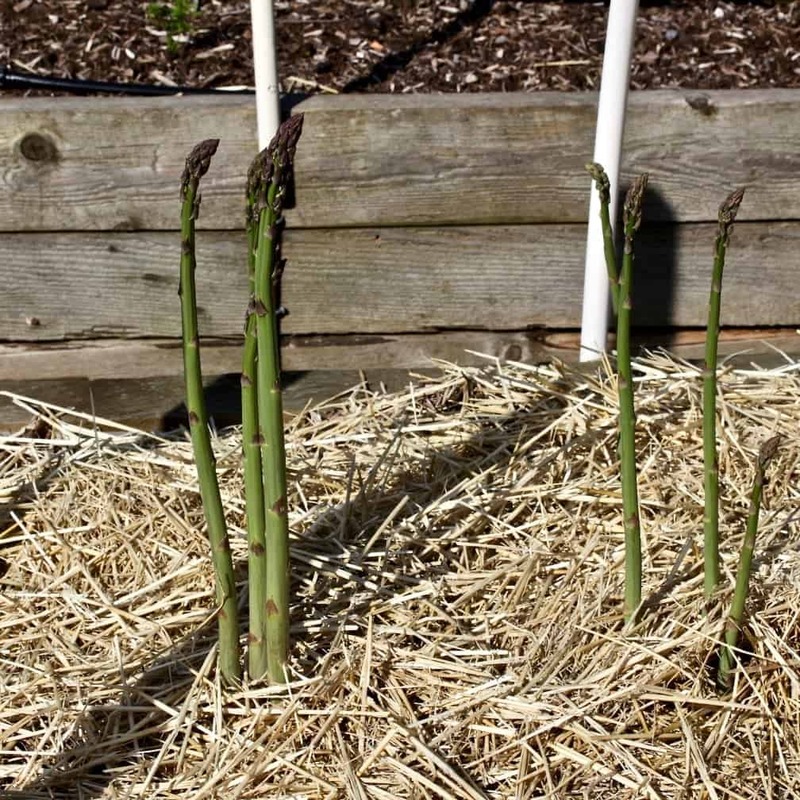 Hi Notkath, We had a similar experience to yours with our first asparagus bed. We still get a few spears from it every year even though we gave up on it and planted leafy green crops over the top of the spears (aWe don’t recommend this by the way if you are trying to establish the bed in asparagus). You might try a better variety of asparagus crown. You can interplant it with your old crowns or replace the old crowns a bit at a time. Make sure your bed is watered and mulched and leave it be for a few years. Your crowns might just need time to grow under ground. The compost will help but if you disturb the old crowns they will need time to reestablish themselves.